I have spent some time trying to find the details of all the Falkirk FC players who served in the Great War, it is not always easy because most of the files were destroyed in 1940 during the blitz. However there are long and laborious ways around this 'problem'. 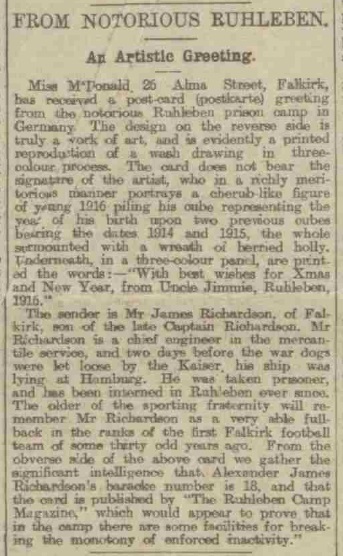 However it was during this that I came across another Falkirk FC related tragedy from the first war: that of James Richardson. James Richardson was like most Victorians Bairns, apart from the fact that due to his Father's profession of Master Mariner, he seems to have born on the Chinchas Islands off the coast of Peru in 1858! An engineer by trade the first time we come across him in the world of football was whilst studying in Glasgow he was playing with Kelvinbank, and brought the team through to play against a team of players from Falkirk in what was reported to be the first match ever played in Falkirk. This was in December of 1877. As far as I can tell he played no actual part in the formation of Falkirk FC, however his wee brother George was the first proper secretary of the club [so he was probably in contact], and he probably helped in teaching the initiates in the early days. After his time in Glasgow he returned to the town where he joined Falkirk for the next couple of seasons, before getting a proper job on the high seas. The next I learned of his life was his return from Germany at the end of World War One. It seems that the steamer on which he was serving was in port in Hamburg when war was announced between Germany and the UK, and the crew were interned in the Ruhleben Internment Camp for the duration. 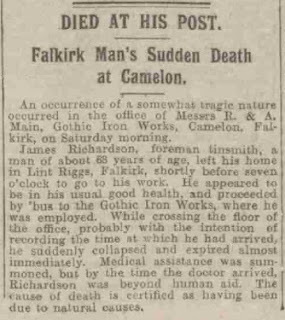 Upon his return to Falkirk he got a post as tinsmith in the Gothic Works in Camelon, where he ultimately died within ten years of his time. 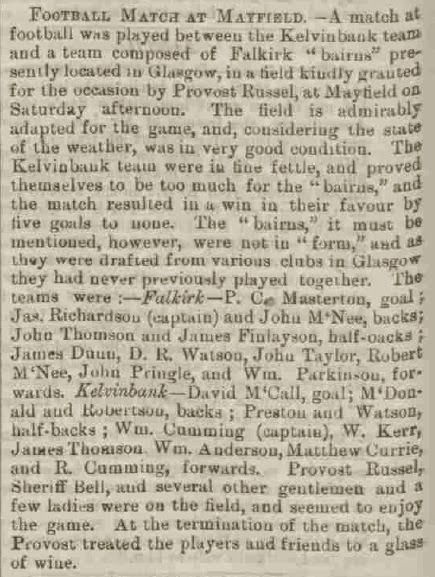 On Saturday last the Falkirk Football Club maintained the series of matches, which during the late storm were wholly put a stop to, when an interesting contest took place with the Kelvinbank men (Glasgow). The weather, on account of the high wind, was not favourable for football, though otherwise very pleasant. The Kelvinbank team having won the toss, decided to play with the wind. Before two minutes had elapsed a rather easily secured goal was obtained by the strangers. The play was inclined to be a little out of order, and nothing particular transpired during the first half, the game standing in favour of the strangers by three goals, the home team never having obtained entrance within the enemy's territory, a result probably due to the fact of the wind being dead against the Falkirk men. Ends having been reversed, curious to say the wind considerably abated, and shifted its quarter away to the south-west, thus presenting the "Bairns" from obtaining the advantage enjoyed by their opponents. The play, however, now became stiffer, but the Falkirk men were by no means in their best form, a deterioration which may be largely attributed to the want of practice caused by the late storm. In the first half the contest was devoid of any noteworthy feature other than the very superior playing of J.Richardson, as back, and J.Law, as half-back, who, although having little style, played with an enthusiasm which made him the most serviceable man on the field. We understand that an arrangement has been made to play a second match, on the 12th of next month, with the Lenzie Club, and from the reputation which the two clubs when matched formerly obtained, and from the fact that the proceeds of the drawings are intended to be devoted to the funds in support of the Industrial School, it is expected that the match will be a more than usually interesting one.